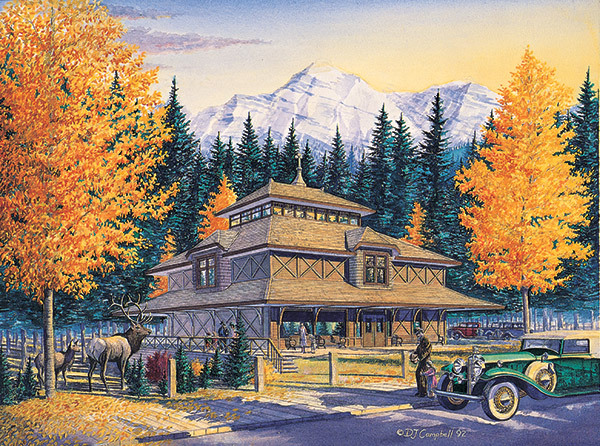 Historic Banff Park scenes Banff Avenue, Banff Springs Hotel, Lake Louise, Banff Park Museum and Banff Park Administration Building reproduced as Limited Edition Prints from Original Watercolor Paintings by Daniel John Campbell. Banff Avenue had one of it's most interesting times during the 1920's. The early frontier look was being look was being augmented by elegant late 19th century resort type architecture, such as the Mount Royal Hotel, and during this time there was an appealing mix of styles. The painting shows the Banff Old Townstreet looking towards magnificent Cascade Mountain, on a cold December morning. The first recorded visit to Lake Louise was in 1882 when the Stoney Natives showed Tome Wilson to the spot they called "snow mountain above the lake of the little fishes". A succession of chalets were built from 1890 until the present concrete chateau was started in 1912. Until 1930 guests were brought in from teh main line by a special narrow gauge tram. The emerald colour of the lake, the symmetry of the mountain reflection, and the looming glacier behind make this one most glorious views in the Rockies. The Banff Springs was originally built in 1888 and was the largest hotel in the world at the time. Redesigned W.S. Painter, it was expanded into the Railway Chateau that we see today. The idea of the hotel was thought of by William Cornelius Van Horne, General Manager of the CPR to help subsidize the finishing of the Railway. The combination aristocratic accommodation, medicinal hot springs, and spectacular scenery was so successful that it turned the small village of Banff into a world famous destination. Built in 1903, the Banff Museum was the first museum in the prairies, and the first natural history in Western Canada. It was designed in the Railway Pagoda style, a style unique to Canadian Railway architecture. The museum, shown in a late September afternoon, is still one of Banff's best attractions. The Banff Park Administration Building, at the end of Banff Avenue, was finished in the 1930's. It was designed by Harold Beckett in a Tudor Gothic style, and like many buildings in Banff, was finished in locally quarried Rundlestone. Beckett also designed the spectacular Cascade Gardens, which have been preserved intact until today.